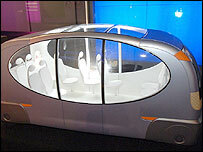 A model of a futuristic driverless bus which promises to cut pollution and congestion has been unveiled. Designers said the state-of-the-art bus will navigate the streets using magnets embedded in the road as markers. Passengers will use their mobile phone to specify the pick-up point and destination of their journey. A small model of the bus or "pod", developed by Capoco Design and the Royal College of Art, goes on show at London's Science Museum. Capoco designer Alan Ponsford said the bus will work out the best and most efficient route for picking up passengers and dropping them off. "The bus goes along sniffing out magnets in the road which tell it exactly where it is, so it can redirect itself to pick up passengers," he said. He said the bus has satellite navigation, intelligent cruise control and onboard systems to control speed and direction and avoid hazards. The buses, with room for up to 24 people, will also be able to join up and run in a "train" where necessary. The bus is an electric/bio-fuel hybrid and the lack of a driver is expected to reduce operating costs by up to 50%. A prototype is due out next year and is expected to be tested in a closed environment, possibly Heathrow Airport. If tests are successful, the bus could become operational within 10 years. Designers hope to showcase the system at the 2012 Olympics in London.